This is the start of a new piece I am working on for Fiber Art Options’ group exhibition. All the pieces will feature orchids. We are hoping to turn this into a travelling exhibition when we finish early next year. 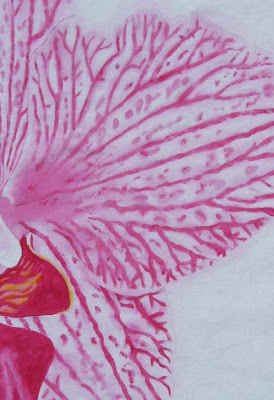 I chose to zoom in tight on the amazing color and pattern on the orchid’s petals. I started by cropping a photo that showed the petals from a more straight-on angle on my computer, then sizing it to the required 12x18", printing it out on paper, and putting it on my light board. A piece of white Kona Cotton fabric went on top, and then I lightly traced the lines (using very soft lead in a mechanical pencil) from the photo onto the fabric. Next, I taped it to my kitchen countertop (which is ancient laminate and can be easily scrubbed clean) and painted with Jacquard Textile Color, brushing the lines in with thick paint, and then with a brush loaded with lots of water to create the bleeding out and blotchiness. I used the same hot pink color on everything, but watered down in some spots, except for the tiniest bit of yellow on the edge of the lip. The open areas will be another color, something dark. I’m very eager to get this under my sewing machine needle and thread paint it! 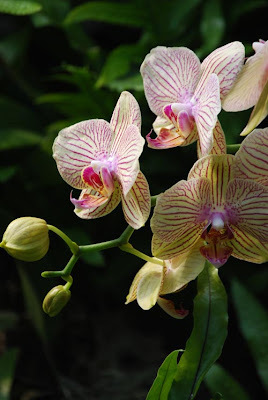 I have always loved orchids for their exotic looks. They seema curious mix of exquisite beauty and delicacy and something darker, more dangerous. Don’t the mouth parts look like they could open up and chomp you? (Well, maybe I watched “Little Shop of Horrors” too many times!) But I stopped having them in my house after a beloved cat ate some of the bark chips that they grow in, and developed Histoplasmosis, an infection caused by the fungus Histoplasma capsulatum that can live in decaying plant matter. By the time we discovered what was wrong, it was too late, and I had to have him put down. When I work on a piece based on something in the natural world, I usually do some research on it, so I can understand it better. It makes the whole creative process more meaningful. According to a great website called Beautiful Orchids, the orchid family has 35,000 species and 60,000 registered hybrids, and has “far more diversity and specialized pollination methods than any other flowering plant.” Vanilla is made from the seed pods of one variety. The ArtQuiltTransitions traveling show has moved to Cary, NC at the Page Walker Arts & History Center. 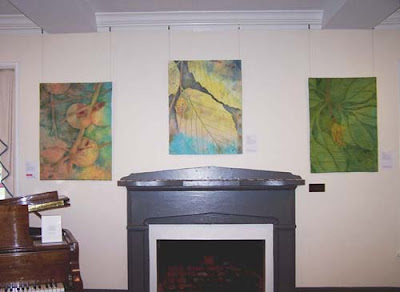 Here are three of my pieces in the show. The one on the left won Juror’s Choice from Susan Brandeis. What an incredible thrill for her to like my work. She is such a wonderful quilter and instructor. To see my post with more photos from this show’s opening in April, click here.